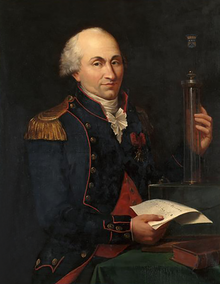 Fisicí a rugadh in Angoulème na Fraince ab ea Charles Augustin de Coulomb (14 Meitheamh 1736 – 23 Lúnasa 1806). Rinne sé taighde ar fhrithchuimilt, agus cheap an toirsiúnmeátán an-íogair chun na fórsaí aomtha leictreacha is maighnéadacha a thomhas. Chruthaigh sé dlí Coulomb i 1785: bíonn an fórsa idir dhá lucht leictreacha díreach i gcomhréir le hiolrú na luchtanna, agus i gcomhréir inbhéartach leis an bhfad eatarthu cearnaithe. Más iad p is q an dá lucht, agus d an fad eatarthu, is é an fórsa eatarthu F = p q/(4 π ε0 d2), agus is tairiseach ε0 (= 8.854 × 10-12 N m2) a dtugtar ceadaíocht saorspáis air. Bíonn an fórsa seo dírithe ar feadh na líne idir na luchtanna, i dtreo a chéile (aomadh) más luchtanna neamhchosúla iad, amach ó chéile (éaradh) más luchtanna cosúla iad. Ainmnítear aonad an luchta leictrigh, an cúlóm, as. Tugadh an leathanach seo cothrom le dáta an 6 Feabhra 2019 ag 22:53.